American DJ WiFLY WLC16 DJParts - All Variety of Parts that DJ Needs. 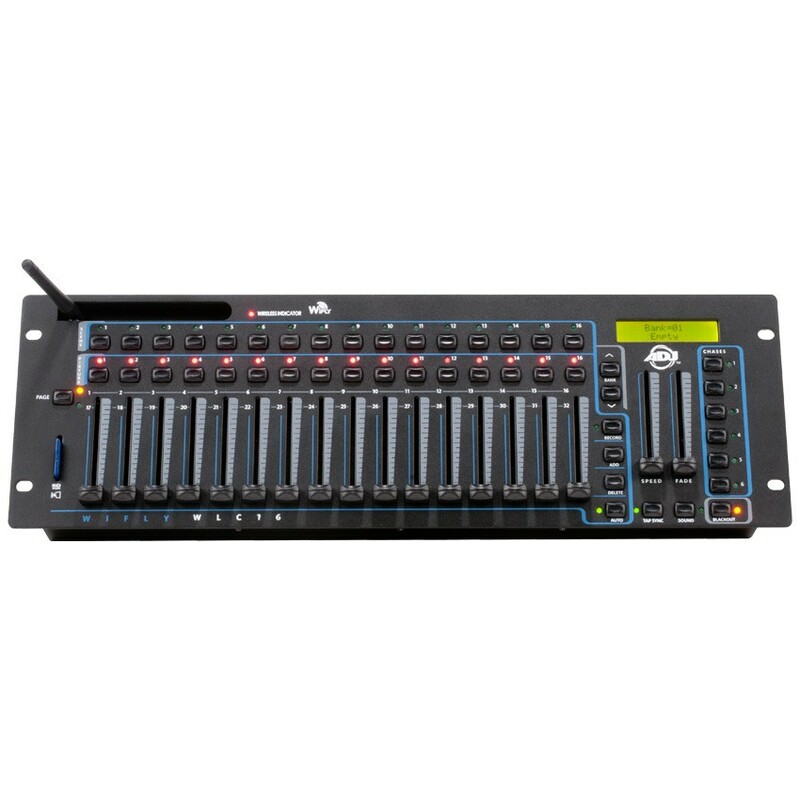 The ADJ WiFLY WLC16 is a 19-inch rack mount, 512-channel DMX Controller with ADJ’s WiFLY, wireless DMX built-in. It allows users to control ADJ WiFLY compatible products wirelessly without the use of DMX cables. It has a built-in antenna that sends the wireless DMX signal to other WiFLY products. There is also a 3 pin XLR, DMX out onboard so that signals may also be sent via DMX cables to non-WiFLY products. The WiFLY WLC16 supports up to 16 fixtures each with up to 32 DMX channels, 30 banks of 16 programmable scenes each, and 6 programmable chases of 480 scenes each. Other features include a backlit digital display, SD card memory, password protection, tap sync and a built-in microphone for sound triggering. 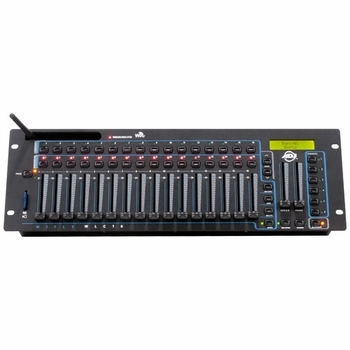 Specifications: • 512 channel DMX Controller with ADJ’s WiFLY Transceiver Wireless DMX on-board • 16 fixtures, up to 32 channels each • 30 Banks of 16 programmable scenes • 6 Programmable chases of 480 scenes • 16 Sliders for manual control of channels • Auto mode controlled by speed and fade time sliders • Master blackout function • 3-Pin XLR DMX out • Password Protection • Speed and Fade control • Tap Sync Speed / Sound trigger override • Built in microphone for sound triggering • Power failure memory • 16 x 2 character backlit digital display • On-board SD card slot (2GB SD Card is included. Supports up to 4GB max) • All programmed data is stored onto the SD card. • Voltage Operation: DC12V 500mA min • Dimensions (LxWxH): 19” x 6.25” x 2.75” / 482 x 155 x 70mm (19-inch rack mount, 3.5 spaces) • Weight: 6 lbs. / 2.7 kg.